I actually had a list for my makeup to buy before I went for my holiday. I read reviews and watched Youtube before deciding on which ones to buy. My list includes MAC and NYX from Sephora. 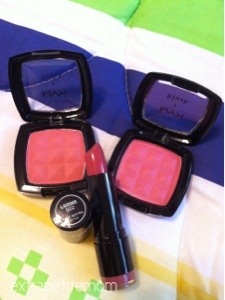 For MAC, I wanted to buy two lipsticks and two blushes and still contemplating on whether to get the paint pots. I do love cream eyeshadows but this one is on a pricier side. MAC lipstick in Syrup (RM68). 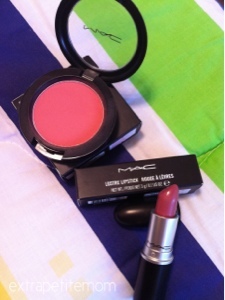 When I reached MAC in Pavilion, I asked for MAC lipstick in Creme in Your Coffee (cremesheen) and Syrup (lustre). However, I was overwhelmed with Creme in Your Coffee so I decided to buy Syrup only which MAC describes as cloudy pink. 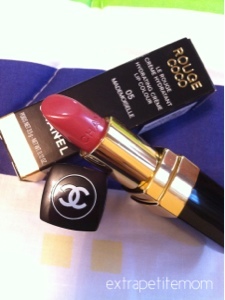 To me, this is definitely my-lips-but-better kind of lipstick. I can see that I'll be using this a lot. I'm glad that Sephora in Malaysia recently launched NYX in their store. From reviews that I have read, I got rough ideas for the prices (cheaper!) and items available. NYX lipstick in B52 - soft mauve pink (RM19). They have a lot of colours available and listed at the counter. However I was only interested in something brownish pinkish/ or reddish because I want to try the colour that looks similar to MAC Creme in Your Coffee. I compared with NYX Tea Rose that I have and tested few other colours including Heredes, Lola/ Lala(?) and a couple more which I have forgot. I'm really happy that I bought this one. This looks pretty on my lips (a bit dark but I'm okay with).